Most often blind or shutter replacements are on the list of home improvements. The variety of choices can make it difficult to choose the more suitable option for you. Luckily those of us at Mesa’s All About Blinds and Shutters, and articles like this to help you find the best thing for you. Read to learn where to find the best Shutters in Mesa. Special window screens are used often to reduce the Arizona summer sun. The window mesh prevents heat and light from entering the room, which will likely lower cooling costs and put some cash in your pocket. Solar shades use woven fabric to prevent light and heat to a degree where glare is avoided and the view and natural lighting is improved. These solar shades have specific weaves that control the amount of heat and light let into the room.The amount of light and heat let in is controlled by the weave rating. The higher the rating the tighter the weave and the significantly less light will get through. When a solar shade’s rating is lower the weave will be more open and the more light will get through. Solar shades will perform better when installed in a window that receives more sunlight than others. A more open weave would be less advantageous for a window like this, the glare will shine through anyways if the weave if to open. A lower rated solar shade will preserve a great view while adding shade to the room. The color will also impact your decision. Colors that are light are earthy toned will more easily permit light in, with the added benefit of slightly reflecting the natural light of your home.Earth tones blend well with most furnishings and keep the atmosphere of the room. Colors that are darker absorb light and darken the area. 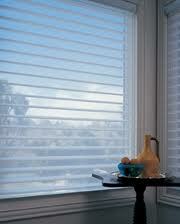 The purpose of solar shades is not to enhance the privacy of a room, you could however, pick a very thick weave. Maintenance of solar shades is also very easy, most times a wipe down with a wet cloth is all that’s needed. Wood blinds give a room a good traditional appearance that is very flexible. Privacy is easily achieved with wood blinds as well as a good style point for a room. Wood blinds come in a variety of widths, so knowing what you want before hand is important. A window can be covered easily with 20 or so large slats. 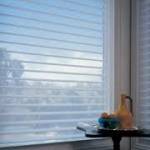 Smaller width blinds can block the view and incoming light better than larger blinds. Typical slat widths are: 1”, 1 ⅜”, 2”, 2 ⅝”, and 3”. A really good way to improve the efficiency of your home is with wood blinds, wood is a natural insulator and will help keep heat in at night. Which will help you save on heating and cooling costs. The ease with which blinds blend into home decor is a different reason why some pick this type of window cover to others. Even if you don’t like the natural wood appearance , many colors and stains are out there. This allows for greater customization of your home. One of the other options for window coverings is shutters. Blinds and shades are on the insides of the home while shutters are primarily on the outside. Shutters also are built into the window frame making them last longer and tougher. Wood shutters will nearly always work better than plastic and faux shutters over time. Many people say that plastic, faux and vinyl shutters become discolored over time more so than wood does over time. The staff here at All About Blinds and Shutters will help make sure this is the right choice for you and your house. Having the right window measurements is very important when picking your new window fixtures and at All About Blinds and Shutters we ensure you get the right ones. When its comes to blinds and shutters there are many trade offs to consider, so making the right decisions requires knowledge. The experience and knowledge at All About Blinds and Shutters Mesa Gilbert will help you with your decision.